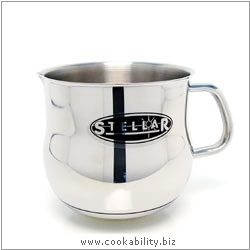 Best value stainless steel cookware on the market. Combines top quality material with excellent workmanship. Tough, durable and easy to clean. Top grade mirror polished 18/10 stainless steel. 6.7mm thermic base gives superior heat distribution and excellent energy efficiency. All around pouring lip for right or lefthanded use..
All round pouring lip for left and right handed use.